This approach, designed as “Activifique platform”, allows a very high efficacy of ingredients used in a healthcare product, and a long-term activity. This is due to the fact that Activifique allows a controlled release of the ingredients. Unlike in standard products, beneficial ingredients are delivered over time to the skin. In some circumstances, the beneficial agents are even activated when the skin most needs them, and less active, when the skin needs them less. 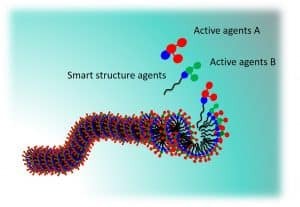 In products that include the Activifique approach, ingredients are made to form supramolecular assemblies organized in leaflets, inspired from biological systems (such as skin). These structures not only confer a soft texture but most importantly they dissolve slowly or when they receive special signals from the skin. As a consequence, unlike in standard creams, the active agents penetrate the skin at a rate that makes it possible for skin cells and layers to benefit the most from their moisturizing, soothing and other activities. Which products benefit from the Activifique technology? At present, the Hydrating Gel Plus HS is the main product that benefits from this approach. To receive more information about Activifique, contact us directly.